With elections over and the 9th Assembly set for inauguration in June, the race for the leadership of the House of Representatives is hotting-up. 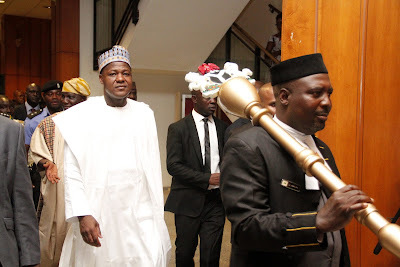 Daily Trust gathered that the six lawmakers have so far dropped hints to seek Speaker Yakubu Dogara’s job. These are Femi Gbajabiamila (Lagos), Idris Wase (Plateau), Umar Bargo (Niger), Mohammed Monguno (Borno), Abdulrazak Namdas (Adamawa), and Mohammed Kazaure (Jigawa), all of APC. Geo-politically, they are spread across South West, North Central, North East, and North West. This is understandable since the APC already commands undisputable numerical superiority of 211 members as against 111 slots won by the main opposition Peoples Democratic Party (PDP), according to figures from the Independent National Electoral Commission (INEC). The House of Representatives is made up of 360 members. Addressing newsmen last week, Gbajabiamila disclosed that the decision on who becomes the next Speaker rests with the APC and the lawmakers themselves. As political groups and caucuses align for common fronts in the epic leadership contest in the 9th Assembly, North Central APC lawmakers in the House requested that the speakership slot be ceded to the zone. That notwithstanding, the contenders have intensified lobby and leg walks to land the topmost job in the nation’s lower legislative chamber. Of all the contenders for the speakership position, Gbaja, as he is popularly known, is perhaps the most visible and consistent. The ranking lawmaker who just clinched his fifth-term also has many things going for him in the contest for the Number 4 position. Gbaja is the current House Leader, and before Dogara emerged as Speaker in 2015, he was APC’s choice for the position. Most importantly, he is from the South West as well as the only major contender from Southern Nigeria who has indicated interest in the position. Should the APC decide to cede the position to the South, Gbaja stands a prominent place to clinch it. It is also believed that it will be a smooth sail for the Lagos-born lawyer given his legislative pedigree and good rapport with other lawmakers. Apart from ranking and zoning, party loyalty and consistency as a vocal voice of the APC, especially during the heyday of the turbulent 8th House, may also count for him. However, a certain school of thought believes that since the country’s Number 2 citizen, Vice President Yemi Osinbajo, is from the South West, the APC might decide to give another zone the speakership slot. According to them, if Osinbajo’s factor were to influence the party’s zoning arrangement, then Gbaja might not stand a chance. The 55-year-old lawmaker, representing Wase Federal Constituency of Plateau State, is also a strong contender for the Speaker of the 9th House. Wase was first elected into the green chamber in 2007, and has been re-elected in 2011, 2015 and 2019. Before his elevation as House Deputy Leader in 2018, Wase was the Chairman of the House Committee on Federal Character. He is believed to command a large followership among influential lawmakers in the 8th House, which could serve him well as the campaign for the position unfolds. Besides, he is articulate with a political connection that transcends the ruling APC. Just like Wase, Umar Bago, is another speakership contender from the North Central. The 45-year-old Bago, representing Chanchaga Federal Constituency of Niger State, was first elected into the House in 2011. Having just won a third term, Bargo could be considered a ranking member of the House. The former bank manager also has age on his side, which is a remarkable asset, especially in the midst of a Not-Too-Young-To-Run mantra. The Chairman, House Committee on Maritime Safety equally enjoys the goodwill of incumbent Speaker, Yakubu Dogara. Having thrown his weight behind Dogara in 2015, political watchers say it is a pay-back time, especially if Dogara ultimately dumps his bid for re-election. But being from the North Central, he already has another strong contender. Monguno, 52, who represents Jere Federal Constituency of Borno State, has also indicated interest to become the Speaker of the 9th House. The Chairman, House Committee on Agricultural Production Services, is perhaps the most ranking contender from the North East Zone. Dogara from Bauchi currently occupies the Number 4 position, and should the APC decide to allow the North East retain the seat, Monguno stands a good chance. He also ran alongside Gbajabiamila in 2015, and would have been Deputy Speaker if the party’s initial zoning arrangement was adhered to. His advocates also point to his dedication to legislative activities especially key committee assignments. As a ranking member first elected into the House in 2007, Monguno also commands the respect and loyalty of many lawmakers, including those from other regions. As it stands now, his chances depend on what becomes of the party’s zoning formula. Namdas, 50, who represents Jada/Ganye/Toungo Federal Constituency of Adamawa State, is the current spokesman of the 8th House. Although he is yet to publicly unveil his ambition, indications are that he is in the race for the top job in the green chamber. First elected into the House in 2015, Namdas is no doubt an influential member of the 8th House, especially given his erudition and intellectual disposition. As the image-maker of the 8th House, Namdas is also popular and well-loved by his colleagues. But those laudable qualities might not be enough to land the graduate of University of Jos the plum job, even if it is eventually ceded to the North East. The argument is that there more ranking, perhaps more qualified members, from the zone who are also in the speakership race. Ultimately, that depends on APC’s zoning arrangement. The 46-year-old lawmaker, who represents Kazaure/Roni Federal Constituency of Jigawa State, is also interested in becoming the Speaker of 9th House. In his usual humorous manners, he informed Daily Trust Saturday that his main aim of seeking the job is to smoothen and fast-track President Muhamamdu Buhari’s policies and programmes in the National Assembly. “If I become the Speaker, whatever Mr. President sends to the House will be passed. I will just strike the gavel and that is it, no debate or unnecessary argument,” the lawmaker, who is also Buhari’s staunch fan, said. But it is highly unlikely that he will contest, or that he will win even if he contests, especially as he is from the same North West Zone as President Buhari.